As a birder who works in the field of conservation, I tend to be more conscious of birds that are in decline on the Vineyard than of species that seem to be growing in numbers. Yet there is no question that changes stressing some populations are creating new opportunities for others. And even as some of our nesting birds spiral toward extirpation on the Island, others are growing in number or showing up to nest here for the first time. So I was not too surprised to hear, on a recent bike ride around the state forest, the songs of a half-dozen house wrens. Six isn’t that many, but it’s conspicuously more than I would have heard on a similar ride 15 years ago, which would have been exactly zero. Scarce as a breeder on the Vineyard just a decade or two ago, this tiny brown package of avian energy has steadily grown in numbers and distribution on the Island in recent years. All wrens are tiny, high-voltage birds, readily recognized as a group by their subdued colors, active behavior, and short tails, often carried cocked up over the back. Two members of this group, the winter wren and the marsh wren, are uncommon but regular migrants here; the winter wren, hardier than its tiny size would suggest, sometimes survives the whole winter in Vineyard thickets, and it’s possible this species has nested here once or twice. House wrens, as their name suggests, often associate with human habitation. 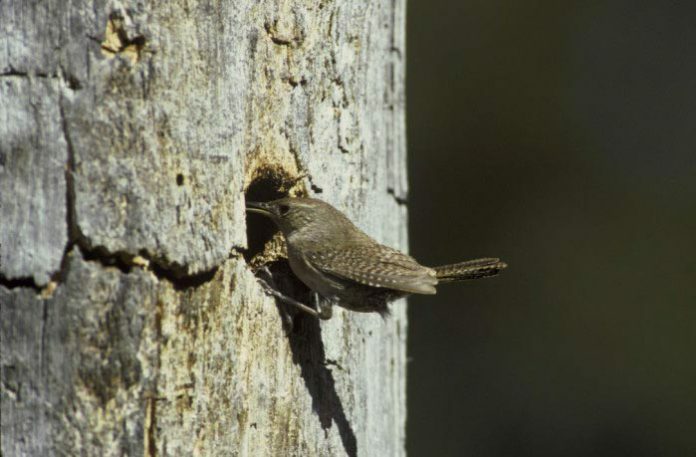 They tolerate human activity well, and for folks who enjoy encouraging nesting birds, house wrens are easy to attract to nest boxes (they prefer small boxes with a very small entrance hole, only an inch or so in diameter, and fairly close to the ground). Certainly some of our growing house wren population lives in human neighborhoods. But as my recent bike ride shows, this species seems to be settling mainly in natural areas as it grows in abundance on the Vineyard, seeming to prefer a mix of oak and pine with a dense understory. Perhaps surprisingly, house wrens inspire controversy; they have a reputation for aggressive territoriality and a penchant for eating the eggs of other bird species. These charges are not unfounded; house wrens pugnaciously defend their nests (including “dummy” nests they may build to impress females or fool predators), and they are capable of displacing other cavity-nesting birds, like chickadees or even bluebirds and tree swallows, from a desirable site. But they’re aggressive toward their own species, too, and hence rarely nest with a density that has much impact on other birds. On balance, I consider house wrens a beneficial species, feeding voraciously on a wide range of insects, many of which are harmful to crop or garden plants. Laying an average of five or six eggs at a time, often attempting a second brood in late summer, and making literally hundreds of food deliveries to their hungry nestling each day, a pair of house wrens can play a big role in controlling insect populations for a sizable radius around their nest. I’m somewhat at a loss to explain the rise of this species on the Vineyard. But its numbers as a fall migrant appear to be increasing, too, and in recent years house wrens begun turning up routinely on Christmas Bird Counts. Perhaps the most likely explanation has to do with regional changes more than Vineyard-specific ones. Across southern New England, woodland and open farmland (neither especially attractive to house wrens) has been giving way to residential development (where the semi-open vegetation appeals to wrens and the level of human activity helps keep would-be competitors away). Also, as a highly insectivorous bird, house wrens were undoubtedly hit hard by pesticide use in the 1950s and 1960s; their numbers may still be rebounding following the banning of some of the most lethal chemicals. If the numbers of this tiny species have been growing regionally in response, the Vineyard may simply be receiving overflow from elsewhere. In any case, to my mind, the rise of this species is a welcome change in our bird life. Active, interesting, and a strong ally of ours in the realm of arthropod control (they even eat ticks! ), the house wren is probably here to stay.